I thought it might be neat to give people a sense of where our speakers come from and the people behind them. It all starts with four people; Paul Nibbelin, Dave Lancaster, Bob Ziegler and myself. For each of us speaker design is something we have been doing for a long time. We each love working with wood and electronics. We have long chapters in our lives as independent contractors doing everything from remodeling restaurants to building houses and custom furniture. 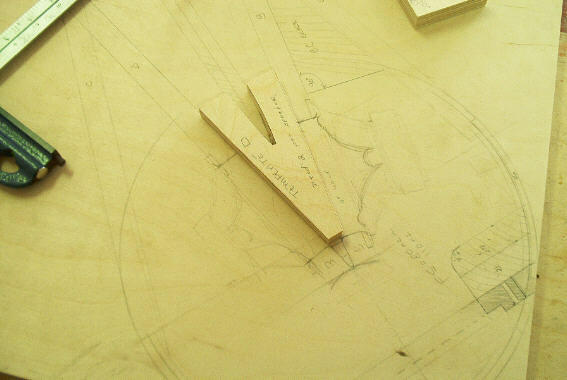 We're all skilled craftsman with that Wilbur & Wright inventive spirit and we dearly love making things. I started this company selling speaker designs and reconing speakers and eventually went on line with it in 1996. 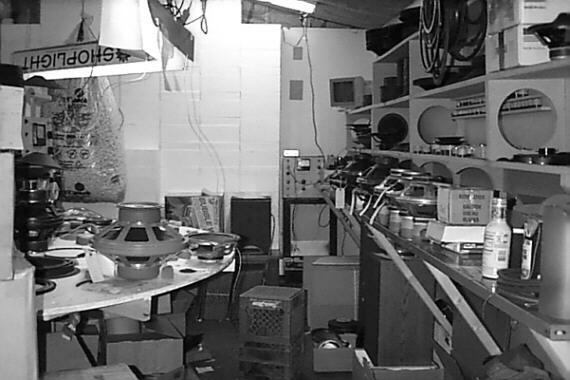 During the years prior to this we had accomplished a terrific amount of R&D and developed a number of novel speaker designs along the way. There came a point where in the quest for perfect sound our speakers got so good the amplifiers became the obvious weak link. My focus shifted at that point, because without better amplification I could not tell how good the speakers actually were. This amplification in the end turned out to be the Zen Triodes. Since these amps were low power all of the speaker designs we have previously done are of little use to us now. Of course ever since the first Zen Triode amp, we have been trying to duplicate it's sound in a high power package that would work on any speaker. Now 8 years later I am certain it can't be done. In fact, it is for a multitude of good reasons proving to be far more practice to focus on high efficiency speakers rather than higher power amps. And this is what we're doing by developing loudspeakers that will work with a couple watts. Most of the things we will be doing will be available in both finished and kit versions with measured drawings for those who want to build from scratch. My role in all of this is to come up with the designs and build and test the prototypes. I do this at my shop at home. I've been at it for close to 20 years now. This is always one of my favorite times. Old clothes, mismatched socks, 6 inches of sawdust on the floor and no distractions! I do my best work in this state. There is something about working with wood, using your hands to create things and letting your mind run free that keeps guys like me balanced. If I just solder amps and talk on the phone for 6 months I start to get out of whack. The sawdust is therapeutic. The ideas for many of the designs come when Paul and I are working together. From a creative standpoint we compliment each other nicely. We became friends back in the day when we were building houses for a living, and share a 6th sense that can be attributed to being born an hour apart. It was Paul who actually started this fever for high fidelity one day when he asked me to build a pair of 28 cubic foot folded horns for his garage system because he didn't want his wife to see him building them. Paul is often the catalyst for new ideas, and is essential for taking a great idea and spinning it off into something even better. A great example of this is the Radial Loudspeakers. My years of work on that were mostly a solo project. When I arrived at the RL-1 and showed it at the VSAC in Washington, I thought I was done with it. Seemingly never satisfied I was listening to them one day trying to improve the sound when Paul showed up and in less then 10 minutes came up with the concept for the RL-2 which was nothing shy of pure genius, because it worked. This is Paul pictured in the photo at the right. Another important element in the process is Dave Lancaster. We can all hear, but another set of good ears never hurts, especially when the person has owned everything worth listening to between 1968 and 1988. Those were the golden years of hi-fi. 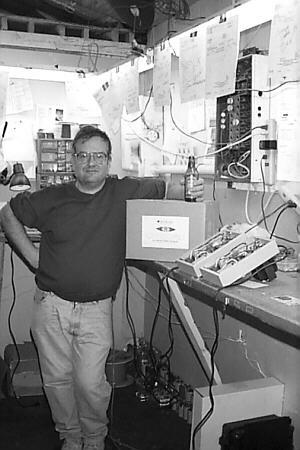 Dave is a master tech who has also owned and repaired almost every guitar amp ever built. He came to work with me when the Zen amps started selling and has built over 1000 of the little buggers since that time! The three of us have a Thursday night ritual where after work we get together in our studio and sponsor a free jam session where musicians in the area can come and play just for fun. Sometimes 20 people will show up, many times it will be just us and our friends. This is Dave pictured at the left. His ears are often the final say. If I like it, and he doesn't, you'll probably never hear it. The most recent addition to this creative group is Bob Ziegler. 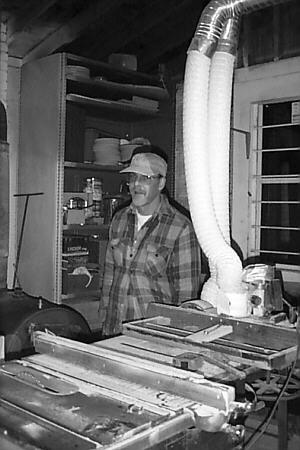 Bob is a world class cabinet maker who builds exotic custom furniture and like us, has a real passion for building loudspeakers. Our paths crossed when a customer brought me one of our cabinet designs that he had Bob build for him. I was so blown away with the precision of Bobs work that I shut down our tiny production cabinet shop and had him start building all of our speakers. When I have a speaker design completed and prototyped I send it over to Bob who builds a production prototype and all the jigs that will be needed to manufacture the speaker. 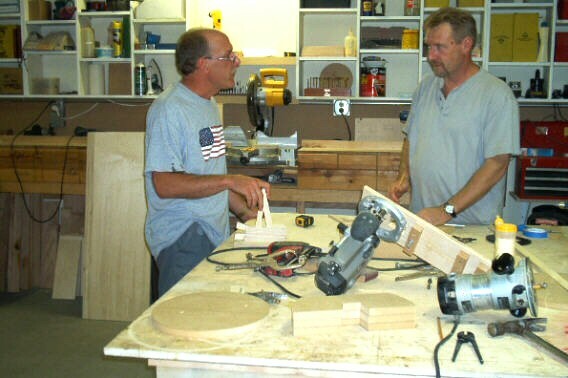 Below is a picture of Bob on the right and myself at his home working out the details of a new speaker design. 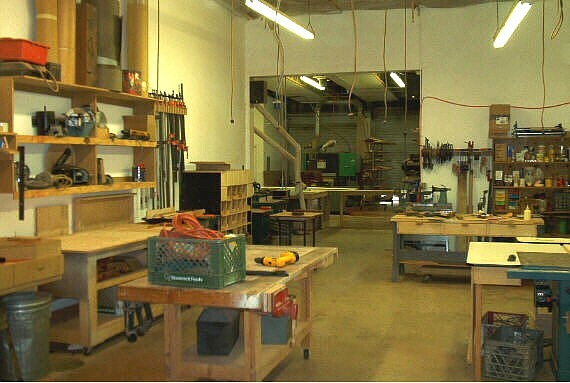 As you can see, Bob's shop is always clean and organized making him the most productive member of the group. This also goes for the production shop where he manufactures everything. In the creative process it seems that lots of sawdust on the floor is good karma. In the production process it becomes a safety hazard. From conception to production. Above is my think tank where the ideas are tested, below is a picture showing a portion of our production shop where ideas are manufactured. 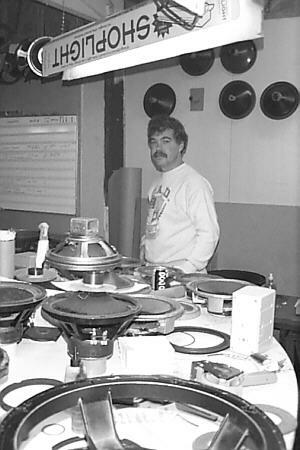 One of the interesting irony's of all this is my very first serious speaker design done back in the 1980's has been pulled out of storage, shown by Bendi in the photo below. It was originally developed as a 2-way with drivers of average efficiency. Back then I didn't even know what an SET amp was and would have probably laughed if you told me I would be building 2 watt amplifiers some day. This special design has been dusted off and reworked for a high efficiency full range driver with no crossover and is now the first of our high efficiency style speakers to be manufactured. Hope you enjoyed the overview - and hope you got some sense of who we are and the things involved in bringing you fine loudspeakers.